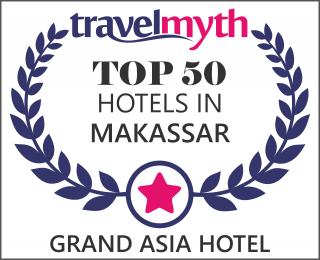 Grand Asia Hotel Makassar is a 3-star hotel located in the centre of business district in Makassar City. Ideal for both holiday and business travelers. Close distance to one of biggest shopping mall, Mall Panakukkang and only 20 minutes drive away from Hasanuddin International Airport. The hotel offers 136 spacious modern rooms in 10 storey building with free wi-fi connection in all hotel premises, which surrounded by business and commercial offices, and also local culinary places. Savor your culinary excitement at our ASIA Restaurant, serving selections of local and asian cuisine, as well as 24 hours Rooms Service order, or chill down at the lobby lounge enjoying selections of beverages and light snacks served at ASIA Lounge. For guest convenience, parking space could hold up to 120 vehicles are provided in basement area. More over Grand Asia Hotel is ready to serve you in various business meeting and other private events. Our Imperial Ballroom available for wedding party up to 1200 person in theater style. Other options for smaller meeting rooms are also available for small participants meeting as well.